Sleigh Arm Futon Sofa In Cherry Finish. Measures, 82Wx38Dx31H. 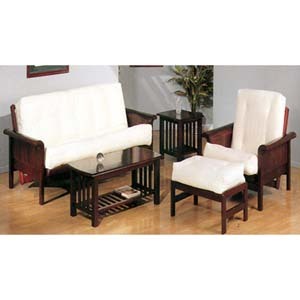 Optional (Not Included In The Price) Sleigh Arm Futon Chair With Ottoman In Cherry Finish Measures, 38Wx38Dx31H. Mattress Is Not Included. Strong Construction. Easy To Assemble. IEM2520C.